Webster defines: REMARKABLE: worthy of attention. While JOURNEY: a journey suggests that a considerable amount of time and distance will be covered and that the travel will take place over land ie. a journey across the Americas. I submit that there is additional sort of journey as well. A journey that involves a life-changing happening. The journey of a soldier to war; the journey of finding a missing loved one; the journey of long threatening illness; and perhaps a journey of the soul to discover a new way of life. I will present journeys like COMING FACE TO FACE WITH AN OCTOPUS with a head the size of a soccer ball while snorkeling in Hawaii. Climbing the rocky wind-sculptured high ridges and deep petroglyphed (1) arroyos of the Valley of Fire, just 22 miles from Las Vegas. Feeling the beach move under thundering thirty foot breaking-su rf of storm waves off the North coast of Maui (2). Photographing Carlsbad Caverns when the lights go out (4). Peering over each new rise of a desert road—”magnificently the sunset becomes a pinker blue, a more violet-orange-yellow, it seemed as if the desert were on fire”…..(3) Mind-dancing to the rhythms of cla ttering wind-blown bamboo stalks in the bamboo forest and gazing at sprays of splashing light cascading through the canopy—high on the back side of Mount Haleakala, Hawaii (3). 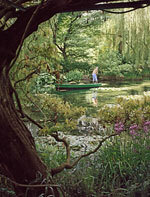 Watching the evening light subtly change at Monet’s garden pool at Giverny (5). The splendor of a sunrise like none other I have seen: Dawn at 10,400 feet on Mt. Haleakala. Lending a helping hand to a lost Mexican woman toting two small children in the desert at the international border—lost, thirsty, and desperate for an offer of water and a compass point to the direction of safety. Visualizing the view of a WWII pilot retro-hiking his air journey over cactus-tops as his plane flew during a secret bomber mission from Seattle to Europe over the Arizona desert (4). Photographing the runaway teenage surfer, living his youthful days at the beach, waiting tables for cash while anticipating the big waves(6 ). Stopping the action on a movie set in Yosemite to help jump start the actor’s car. And learning a lesson of misjudging the intentions of some really fine, kind, young athletes. The story of Barak Obama is a Remarkable Journey. The incredible journeys of John Muir walk ing across America are Remarkable Journeys. In this blog, my aim is to tell tales of many journeys, my own—but also those made by people I have met and will meet along the way, traveling with my little dog, Minna. Through interviews and journalism; photography and audio/video. It is my hope to meet new friends, learn about life, learn about local foods and customs. Re-creating a special recipe can be a journ ey, sometimes just going to church, a play, a movie can be as well. Articles will appear that describe my current adventures beginning in the southeast. In addition, I will write about destinations that I have enjoyed in my lifetime such as secrets of the Hawaiian Islands, Deserts of the Southwest, Appalachia, Adirondacks, Puget Sound, California coast, Yosemite, New Orleans, Paris, Provence, many more. Stay tuned It will be a fun ride. Informative travel tips, wonderful recipes, photography, art, literature, and some monkey business too!